﻿﻿﻿"Mon Tribute A La Vie_A L' Amour_A Vous" ﻿﻿ ﻿ "Mi Tributo A La Vida_Al Amor_A Ustedes"
﻿I am currently creating a new musical for 2015 ﻿in Two acts, with the story line in three different versions for three different audiences, English, French and Spanish, where I'll be singing 24 beautiful musical numbers, originally interpreted by the one and only Barbra Streisand. The fallowing two, 2 act-One Woman Musicals are of 1 hour 40 minutes each, plus a 15 to 20 minute intermission. "An Evening..." can also be performed as a one woman show, or with 4 to 6 male actors/singers/dancers. 1) "An Evening With Marilyn * The Musical * Her intimate Self Portrait"
2) "Nostalgie"-Growing Up With The Movies-Variety Musical"
Based on my life, This is a "One Woman Variety Musical Tribute" to my parents, my siblings, the values and the music they taught to love, from broadway and classical, to international music, jazz, movie musicals, and opera. Also both musicals could be performed as two different and separate shows of one hour each. 4) "Marilyn and The Men in Her Life * The Musical* Her intimate Self Portrait"_Part II"
Is a musical show with songs from broadway and classical american as well as world standards in several languages, as a tribute to diverse cultures and their music, such as: american, brazilian, french, german, italian japanese,, spanish and yiddish. 8) "Sentimental Journey-A Visit With Great Ladies of Song"
A Show performing the songs made classic by: Ella Fitzgerald, Barbra Streisand, Sara Vaughn, Billy Holiday, Edith Piaf, Judy Garland & Ms. Doris Day. 9) "Une Soiree Avec Marilyn * Le Musical* Son Intime Autoportrait"
10) "Marilyn et Son Plombier, Qui se Prendre Pour Frank Sinatra"
Avec Les Chansons en Anglais et Francais. I write and perform any of my work in English, French, Italian and Spanish. I also sing in eight languages...and I'm learning new ways to express myself. 11) Feature Film in 35mm: "La Negrita"-"The Miracle of Our Lady of Los Angeles"
Besides writing the screen play and serving as co-executive producer with Mr. Victor Bonilla, Mrs. Esperanza G. Bonilla and Mr. Luis Bonilla G. in "La Negrita", I performed as "Juana Pereira" with Mr. Rafael Banquells, who played 'my' "Abuelo Julian", the two leading characters in the 35mm full length feature film production of “La Negrita-The Miracle of Our Lady of Los Angeles" 'A Light in The Forest', which I wrote in the spirit of family, love, brotherhood and equality amongst all men and women, as represented by Juana Pereira, a young woman, of humble origins and mixed blood, who lived in the rain forest, just outside of Cartago in the year of 1635. 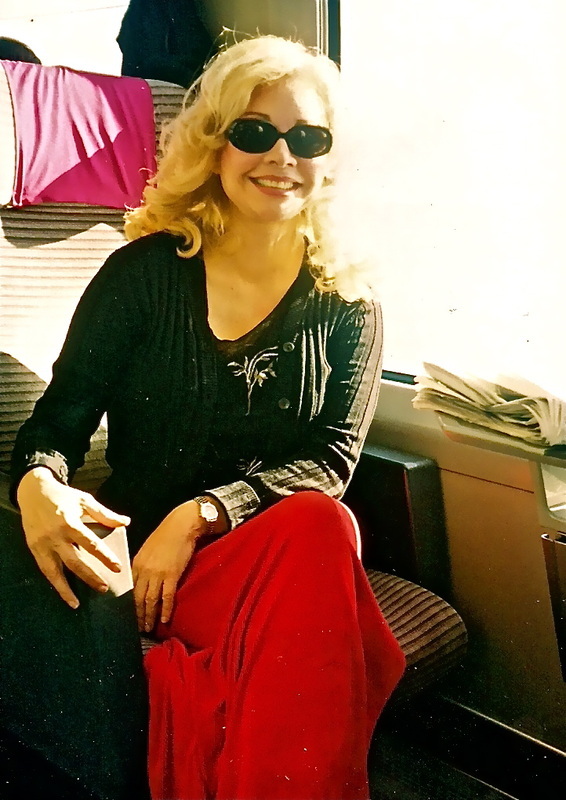 I served as the line producer, production manager, wrote the contracts for the crew and talent, wrote and sung the english and spanish lyrics for 'Costa Rica', the title song, and performed Schubert's "Ave Maria", backed by virtuoso Spanish guitarist Mr. Leonardo Navarro de Avila at the end of the film as the final tribute and expression of gratitude to "Our Lady" for her help in having been able to finish successfully, no only the difficult location shoot, but bring the film to completion. "La Negrita" was shot also in Spanish, except for the prologue. The film is presently available in Spanish as originally shot, with English subtitles. If I was able to do ALL THOSE NEW JOBS AND bring to the finish line THIS FILM or any of my products, it has been through faith, determination, perseverance, hard work, never accepting NO for and answer, finding different ways to do a good job inspite of apparent adversity, but above all with LOVE! B.) “Vatostein”, an ensemble, multicultural musical youth comedy, which takes place in present day Los Angeles, Chicago, New York, Miami or a similar multi-ethnic metropolis. I co-produced my first CD_"Consigueme" in Spanish and French with Mr. Rafael Ferro-", who for over 44 years has played a major part in Julio Iglesias’s career as /musical director/ arranger/ composer and close friend. I have written original songs for recordings and 'parody lyrics' for some of the songs in my live 'one woman variety musical plays' in English, French, Italian, and Spanish. "My Tribute To Life_To Love_To You"
"Mon Tribute A La Vie_A L'Amour_A Vous" "Mi Tributo A La Vida_Al Amor_A Ustedes"
I am currently creating a new one woman musical play for 2018-2019 in Two acts, with the story line in three different versions for three different audiences, English, French and Spanish, where I'll be singing 24 beautiful musical numbers, originally interpreted by the great and only Barbra Streisand.